These updos will take your holiday party look to a new level! Updos for long hair are classy, easy to manage and always look great for an event — whether formal or informal. Celebrities are often seen in flattering updos on the red carpet, but the big question is: How we can get the same look without professional stylists? While we all don't have movie premieres to attend, the holidays are quickly approaching with plenty of parties and family gatherings where you'll want to look your best. 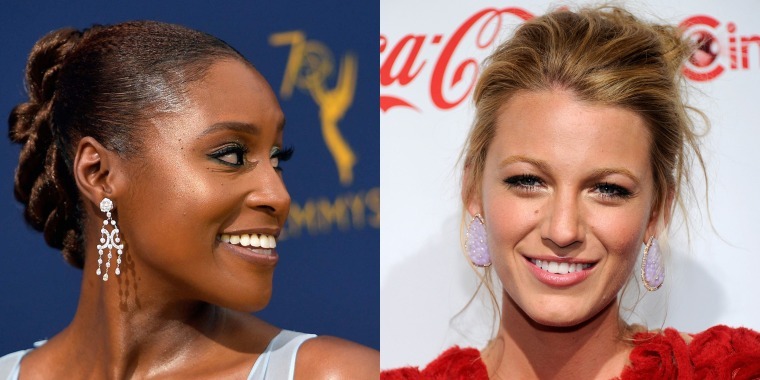 To help, TODAY Style rounded up 20 of our favorite celebrity updos for long hair that you can actually copy at home. From braided updos to top knots and half-up styles, these easy hairstyles are worth perfecting before your next event. Carrie Underwood's loose braid is both chic and easy to accomplish. Simply pull hair into a low, loose fishtail braid and tuck the end underneath, securing with bobby pins. Make sure to leave out a few wispy pieces to achieve her undone look. While they're an obvious staple for music festivals and weddings, crown braids can work for almost any event. Start the braid behind one ear and braid around the top of the head until you've made it all the way around. Secure the end with an elastic and then tuck the braid into the nape of the neck (or beginning of the braid) to get the full circle look. Why does an updo have to pull the hair back? Comedian Jessica Williams turns this around by pulling her hair forward into a cool braided style. Channel your inner Meghan, Duchess of Sussex, and her signature look by pulling your hair into a low chignon at the nape of your neck. Simply pull your hair into a low side ponytail and then twist into a bun and secure with bobby pins. Nicole Kidman's easygoing style works for a fancy restaurant or a laid-back movie date just the same. Leave a few face framing pieces out of the bun to make it look effortless. It's no question that Blake Lively can pull off any hairstyle she wants, but this messy updo might be one of her best. Complete the look with statement earrings, since the swept-up style will show them off. This messy updo is made possible by adding texture to the hair and curling it before pulling it up. Selena Gomez's romantic updo with a side part lets the dress shine. Pull pieces out of the style in the front and back to achieve her undone look. The key to this style is leaving a large chunk of hair out of the messy top knot, which creates the illusion of side bangs. This sleek look proves that ponytails aren't sloppy and basic. The key here is to tease underneath the ponytail to get volume. Ariana Grande is known as the queen of the high ponytail, but her style is easier to do at home than you'd think. Start by pulling straightened hair up into a tight ponytail on the crown of your head, using gel and hairspray afterward to smooth. Take a piece of hair from underneath and wrap it around the hair tie until you pin it underneath. Want to make a statement? Try Issa Rae's polished updo, which is sure to be the focus of your look. Scarlett Johansson's french twist looks perfectly polished for a Broadway opening. Tease the front of your hair to create volume before pulling back. To get Kiera Knightley's retro hairstyle, roll the hair up tight to your head and pin in place using bobby pins. Tessa Thompson's 2018 Met Gala look takes the high bun to a whole new level with three layers. While she probably used extensions to achieve the height, you can easily do one polished layer with long hair. Whether you're looking for something more casual or dressed up, a top knot is the way to go. Chrissy Teigen's low-maintenance style is one of the easiest and most stylish updos to pull together. Take a cue from Zendaya and add some gold embellishments to your top knot for a glam look. No one pulls off a statement ballerina bun quite like Salma Hayek. Don't want to pull your hair completely up but want to add a little something? Try a half-up, half-down style like Jessica Chastain did with this voluminous, pinned-back look. This half-up, half-down style is just messy enough to balance her demure pink outfit. Place the ponytail high on your head to achieve Rihanna's level of volume.